One of the most popular celebrations around the world, Halloween is observed on October 31. What started as a mixture of pagan and Christian tradition has evolved into a secular and commercial celebration popularized by American movies and TV shows. Halloween is believed to have evolved from Samhain, a Gaelic festival marking the end of the harvest season and the beginning on winter. Observed halfway between the autumn equinox and the winter solstice, Samhain is one of the four Celtic seasonal festivals, along with Imbolc that marks the beginning of spring, Beltane that marks the beginning of summer, and Lughnasadh that marks the beginning of the harvest season. After the introduction of Christianity to the British Isles, Samhain merged with All Saints’ Day (November 1) and All Souls’ Day (November 2). The name “Halloween” was derived from All Hallows’ Eve – the eve of All Saints’ Day, also known as All Hallows’ Day. It dates to about 1745, but historians have used the name “Samhain” to refer to what we now know as Halloween customs up until the 19th century. Halloween was brought to North America by Irish and Scottish immigrants in the mid-19th century and became a major holiday by the first decade of the 20th century. Some of the most popular Halloween attributes and traditions (Halloween costumes, jack-o’-lanterns, trick-or-treating in its present-day form) developed back then. A jack-o’-lantern is a carved pumpkin lantern associated with Halloween. It is believed to be derived from an old Irish legend about Stingy Jack, a drunkard who bargained with Satan and was doomed to roam the Earth with only a hollowed turnip with a piece of coal inside to light his way. The first jack-o’-lanterns were indeed made from turnips, but Irish immigrants to the United States began to use pumpkins instead. Today, jack-o’-lanterns are widely used as Halloween decorations both in the United States and in other countries that celebrate Halloween. Another Halloween tradition is trick-or-treating. Children dress up in costume and go from house to house, asking for candy and other treats with the question, “Trick or treat?”, implying that they will perform mischief on the homeowners if they get no treat. Halloween costumes, by the way, aren’t solely worn by children who go trick-or-treating. Dressing up is actually one of the most popular and well-loved Halloween customs. Originally modeled after supernatural creatures, the selection of Halloween costumes has expanded over time to include pop culture characters, celebrities, and whatnot. 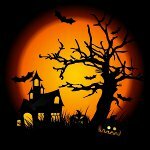 Activities traditionally associated with Halloween include attending themed parties, telling ghost stories, watching horror films and Halloween-themed episodes of television series, visiting haunted attractions, eating candy/toffee apples, apple bobbing, lighting bonfires, divination games, and playing pranks. Although Halloween is tied to All Saints’ Day, it has ceased to be a religious celebration. In fact, some Christians seem concerned about the modern celebration of Halloween because they feel it celebrates practices associated with paganism and incompatible with the Christian faith. In general, Christian attitudes towards Halloween are quite diverse.